Placemats with NBA logo lined the tables. On Saturday, November 1st, the Kiwanis Club of Alexandria hosted their first annual Pancake Breakfast Fundraiser in support of the Holy Savior Menard Key Club. 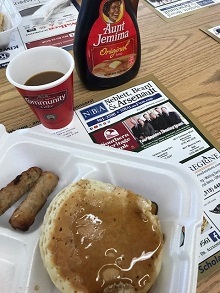 Held at Holy Savior Menard High School, a ticket purchased at the door allowed attendees a delicious breakfast of buttery pancakes, fresh sausage, and steaming hot Community Coffee. Key Club and Kiwanis Club members volunteered their Saturday to help flip hundreds of flapjacks and sell tickets at the door for hungry visitors. Placemats lined the cafeteria tables, each one displaying Neblett, Beard & Arsenault’s logo. Warm, fluffy pancakes were served with a smile by members of the Kiwanis Club and Key Club. All funds collected from ticket sales, and sponsorships from Neblett, Beard & Arsenault and other local businesses, were given to the Kiwanis Club of Alexandria Foundation Scholarship Fund. This scholarship annually provides a one-time $1000 scholarship to an active Key Club graduating senior to assist with the cost of higher education. 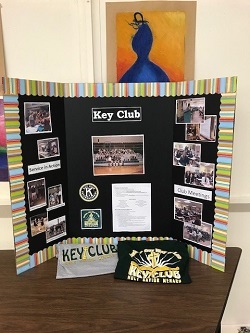 The Holy Savior Menard Key Club is a service organization that focuses on school and community betterment, and all members participate in community service and student leadership projects. The Kiwanis Club of Alexandria and its members are also dedicated to serving the local community through service leadership programs, community service, fundraisers, and projects that create a lasting positive impact on Cenla’s neighborhoods and communities. The Kiwanis Club has been active in programs such as The Eliminate Project, which works to eliminate maternal and neonatal Tetanus, where they partnered with Unicef to raise over $135,000 to protect over 75,000 women and their future children from maternal and neonatal tetanus. Together, Key Club and Kiwanis Club members across the nation have worked to pitch in more than 18 million hours of service for communities, families, and projects. Neblett, Beard & Arsenault is delighted to help support our local chapter of Kiwanis Club and Key Club, and wish them success in future service projects. Key Club proudly displayed their many community service projects at the event.